I could of course buy him a box of chilli chocolates, and I have done this many times in the past. It’s just that my husband and I are real chilli fiends, and we find the chocolates you buy in the shops never have a strong enough chilli kick for us. When you make them yourself, you can tailor them to your individual tastebuds and make sure they have some proper fiery oomph. I also added a little crystallised ginger to my chocolates for extra flavour and another layer of spicy warmth. I used a raw chocolate making kit from Elements for Life to make these bad boys. The kit provides all the ingredients you need, including Wiltshire grown Habanero chilli, as well as the pretty silicone moulds, and the recipe is a sinch to follow. Although I should point out the crystallised ginger and fresh chilli were my own additions. If you fancy trying out the kit yourself, there’s a chance to win one at the end of this post. Dark and spicy and divinely smooth, I’m a big fan of these chocolates. Even my girls are fond of them – only the ones containing chilli powder; the ones with fresh chilli would be way too hot for them. But then it’s no surprise that our children can cope with a little heat, given their parents penchant. Normally, I’d suggest children stay away from these chocolates. Strictly adults only. They are dairy free, so ideal for vegans and people who are lactose intolerant, and also gluten-free, so great for coeliacs. Nor do they contain any refined sugar, so perfect for diabetics. But why raw chocolate? Well, apparently raw chocolate is pretty good for you. With normal chocolate, the cacao beans are roasted, destroying much of its nutritional value. Plus it generally contains refined sugar and fat. 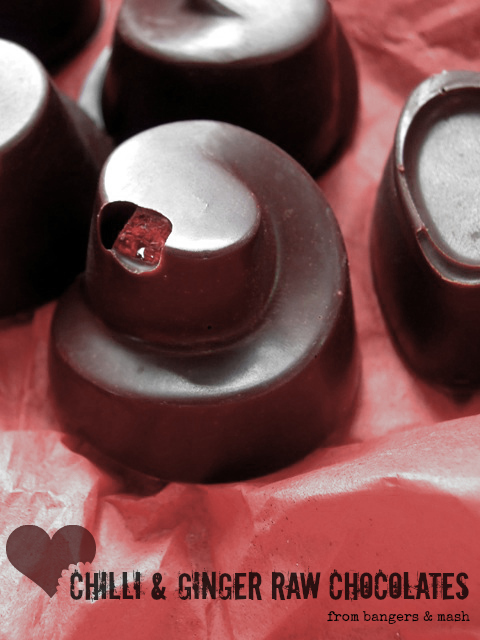 Raw chocolate on the other hand is one of the richest sources of magnesium and contains higher levels of anti-oxidants than either red wine or green tea. It’s full of essential amino acids, feel good chemicals and vitamins, and is even said to be an appetite suppressant. Place a clean bowl over a saucepan of hot water to create a bain Marie). Ensure the bottom of the bowl does not touch the water and no water goes inside the bowl. Add the cacao butter to the bowl and allow it to melt slowly. Don’t keep the water boiling; take it off the heat and just give it a quick blast every so often if necessary. Next, add the cacao powder slowly and stir in thoroughly with a whisk or fork, until it starts to thicken slightly. The chocolate should be runny and easy to pour. Once the cacao powder is mixed into the butter, add the chilli powder and stir in. Go steady here. Start with a quarter of a teaspoonful and give it a taste. Add more if you want a little more fire. Pour in the Sweet Freedom sweetener and stir in well. Taste and add a little more if you like it sweeter. Add the chopped ginger and mix in. 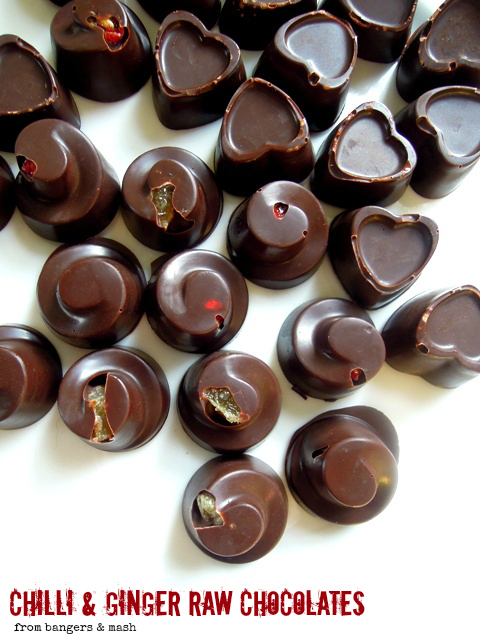 Before pouring the chocolate into the moulds, you might like to add a little of the chopped ginger or maybe even a slice of raw chilli into the bottom of each one. 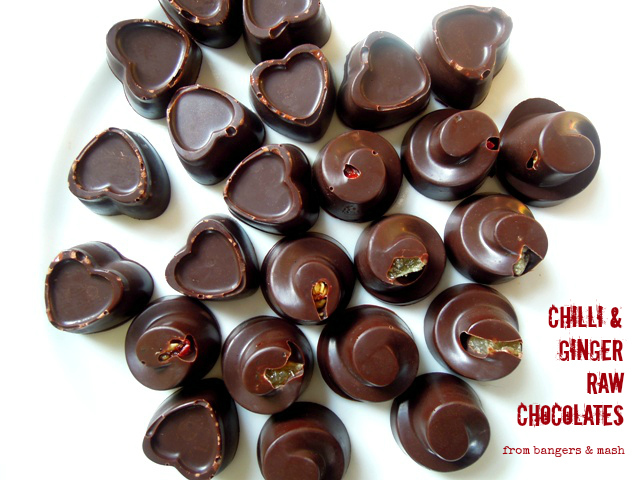 Carefully pour the chocolate into the moulds using a jug or spoon. Place it in the fridge to set for an hour or so, or in the freezer if you can’t wait that long. Perfect served with a strong cup of coffee at the end of your Valentine’s meal. Enjoy! 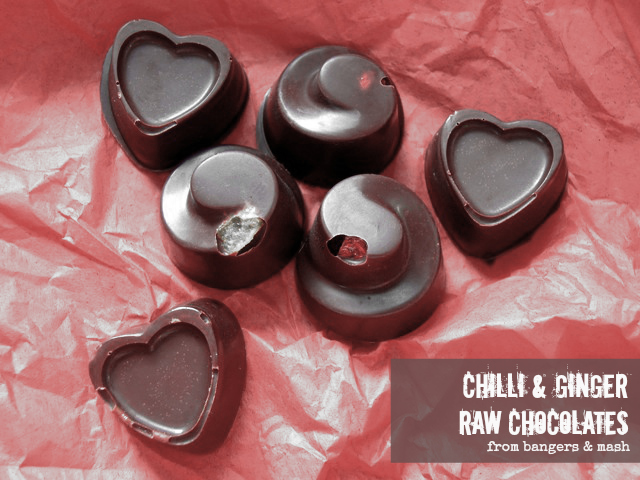 For the chance to win a raw chilli chocolate making kit from Elements for Life, simply leave me a comment below. The first name drawn from the ‘hat’ (or whichever receptacle comes to hand first) will be sent a complimentary kit. Closing date for entries is Wednesday 12 February 2014. Disclosure: Elements for Life provided me with a complimentary chocolate making kit for review purpose. Yum! I am a big fan of chilli chocolate and agree that the shop bought variety is fairly tame. Love your homemade version, with the extra kick from ginger. I will definitely have a stab at this, although I can’t promise they will turn out to be as perfect as yours. chili and chocolate works perfect together just like husband and wife, LOL . fun aside, I love using little cayenne in chocolate but this looks outstanding. love to try it for sure. These look great Vanesther, so pretty and shiny and the combination of ginger and chilli has got to be one of the best. I particularly like the swirly shapes which are a bit more unusual. These look incredible! Lovely shape and shine too. You’ve made beautiful looking chocolates. I really like the combination of chilli and ginger with the chocolate. WOW these look amazing Vanesther and a great flavour cominations. Spicy! Beautiful pics of beautiful handmade chocs Vanesther!. Love chilli choc AND ginger choc and together they’ve got to be good. Such a thoughtful handmade gift, much better than being given a box! And I’d love to have a go at making my own too. I am very very impressed with the finish you got on those Vanesther and they they are so smooth. Raw chocolate can be a very tricky one to get right. Your choice look fabulous, love the way the filling is peeping out of the top! 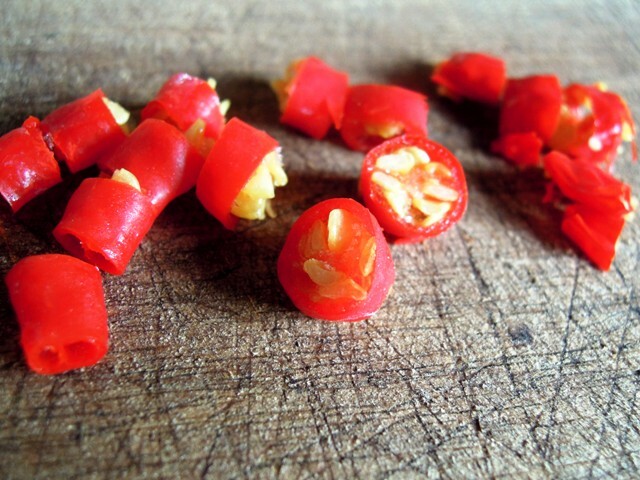 I love ginger, but I am a chilli coward, so heavier or the ginger for me please! These look delicious. I’ve recently gone 60% raw and discovered the benefits and superior taste of Raw Choc. Wish I’d seen this post before the comp deadline.